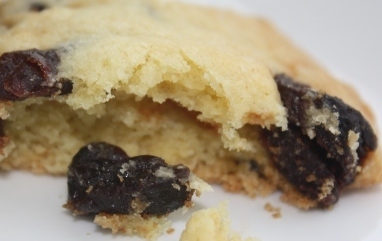 Gluten Free Cherry Cookies, easy to follow tasty recipe. These gluten free cherry cookies are made with real butter and lots of dried sour cherries giving them a fantastic flavour. They are an ideal treat to share with everyone whether they need gluten free food or not. We have noticed how cookies seem to span the generations, loved by all ages from Grannies to Grandsons, Grandpas to Granddaughters. We have found that these cherry cookies are particularly popular with grown ups. They are a lovey accompaniment to a chat over coffee with a friend. Or, if you want to make clients or business contacts feel extra special, serve these home made gluten free cherry cookies at your business meetings. It will help you stand out from the crowd and give you massive brownie points with any clients who need gluten free. These gluten free cherry cookies are easy to make and make a lovely moist chewy gluten free cookie. 8. Add the dried cherries and mix gently with a spoon only as long as it takes to mix the chocolate evenly through the mixture. Why not try our recipes for Gluten Free Chocolate Chip Cookies and Gluten Free Cranberry Cookies.